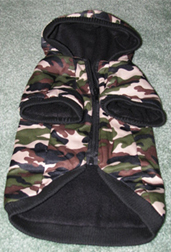 Jolly Puppy has fleece clothes, sweaters, jackets and clothing for dogs and puppies. Our Tails of the West Denim Jackets are great looking and comfortable.Vintage denim with rhinestone-studded pockets and collar and a chic western-style back yoke.Loose fit, comfortable design.Four Velcro closures for a secure fit. To ensure the correct fit, measure from the base of the neck to the base of the tail. The number in inches corresponds to the size Number. Also, if dog has a stout build, a deep chest, or is overweight, we recommend going up a minimum of one size for proper fit. 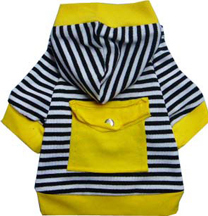 Cute and fun striped sweater hoodie for dogs. Comfortable and cute with a functional pocket. (snap is for show only) Reasonably priced. Sizes available are 8, 10 and 12. Please see size chart for a more complete sizing. 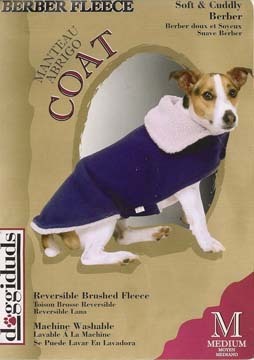 Your dog will love roaming around in this cool looking outfit. More information and size chart. Berber Fleece Coat Machine Washible. 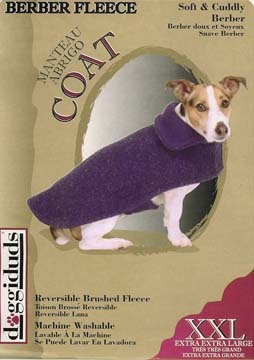 Simple but your puppy ot dog will love this on those cold nights. 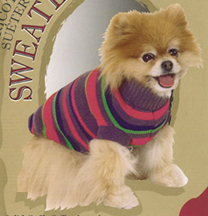 Cozy Chenille Dog Sweater Striped with Bright Colors as Shown. Sizes available are medium, large and x-large.